It doesn’t matter whether you are a smoker, or you want to or need to have a lighter on hand for various reasons, running out of fuel can always be a drag, no pun intended. With the Atomic Lighter all of these issues are taking care of. The Atomic Lighter is unlike any other type of lighter on the market in the sense that it is actually flameless and utilizes plasma arc tactical technology, This makes it able to withstand many of the natural elements, such as wind and rain, and it will absolutely produce fire 100% of the time, every single time, and because it is 100% rechargeable it will hold up to more than 100 lights per charge through a USB cable. The claim of the Atomic Lighter is that without gas or butane, with a single charge it will provide you with 100 lights or more. It will be able to withstand many of the elements such as rain or even heavy winds and will provide you with a sturdy light every time. This fuel-free rechargeable lighter is a must-have for every type of survival kit, especially the fact that no matter how wet it gets, because there’s no flints, it will always light as long as the charge is present. Its because of an electrical charge that is generated that no fuel is ever needed to make a spark and only between two points is a sufficient point to make an ignition similar to a flame. Obviously the big hype with the Atomic Lighter, is that no matter what you need it for, as long as you have it charged to a USB Port you’ll have more than 100 lights available to you. The Atomic line of products have gained notoriety because they are able to withstand just about any type of abuse out there and still be able to produce what they advertise they are capable of doing. For example, with this lighter you can drive over it with a vehicle, freeze it, use a hammer on it, and it still works as good as new. 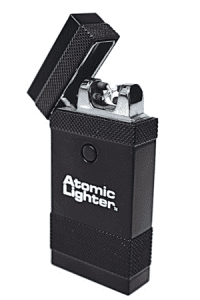 The cost for the Atomic Lighter is around $19.99 depending on where you buy it. The quality of the Atomic Lighter is truly unique in its quality or effectiveness and is designed so that you are able to take it to any type of camping and hiking excursion, or anywhere else where it might fall into any type of damage that might impede its usefulness. Hunter Ellis and several former Navy Pilots endorse this product and claims that this lighter is better than any other that they have ever used before and they state that it is well worth any money you would pay. After checking out this product it seems the Atomic Lighter is well worth the price especially when for a simple charge you can get over 100 lights and your lighter can withstand all types of weather conditions. The review have been nothing but outstanding in regards to how people have loved this item and they would definitely recommend this item to their friends.
. The fact that no fuel is ever needed and it will light under extreme conditions make it an asset to anywhere it may come in handy. We are prepared to give the Atomic Lighter a thumbs up. If you are looking for an alternative in lighters then you may want to look at the Forever Lighter. What do you think? Does the Atomic Lighter work or not? Does the Zero Breeze Battery Powered Portable Air Conditioner Really Work?